Higher insurance premiums for 3-5 years following the incident which are far greater than the cost of a lawyer. Points appear and accumulate on your master driving record. The prosecutor will consider tickets that appear on your record should you contest future tickets. Employers may deny or limit your use of company vehicles. Getting a ticket set aside after you admit responsibility is expensive and not guaranteed. In this publication, authored by Cy M. Abdo & Joseph A. Campbell, we explain why you should fight every traffic ticket and what outcomes can be expected in the court system. In addition, we describe how the insurance industry uses tickets against you to increase premiums for several years beyond the date of the ticket and why higher risk drivers (the young and elderly) should be especially diligent about their driving records. This publication is based upon our experience handling civil infractions and criminal traffic tickets for 1000’s of clients in every Macomb County district court. What can an attorney do for me if I get a traffic ticket? The path of least resistance, paying the ticket versus fighting it, is not economically logical. The best course of action is to fight every ticket with a skilled traffic defense lawyer. Having an attorney who knows how to negotiate traffic tickets can make a huge difference in the outcome as well as your household’s bottom line budget for the next 3-5 years. In our experience, we always leave the court system better off than we started. On a consistent basis, traffic tickets can be resolved with an advantageous outcome which will protect your driving record and save you hundreds, and sometimes thousands, of dollars per year. Who benefits most if you pay your traffic ticket without a fight? When you simply pay a traffic ticket without a fight, the government wins the battle because they get their full fee for the citation as originally written. However, insurance companies win the long-term war because they use the information placed on your master driving record by the government to rate and adjust your premiums for the next 3-5 years, depending on the citation. Insurance companies use many factors to determine your insurance premiums including: your zip code, credit score, type of vehicle, and your driving record. Nerdwallet has a list of the cheapest vehicles to insure, with the Honda CR-V topping the list and several Toyota models in the top 25. The insurance industry will use information on your driving record (accidents and tickets) and assign “insurance eligibility points” when you apply or renew your auto insurance. Insurance eligibility points are not the same as the points assessed by the Michigan Secretary of State. Insurance companies use their own point system for purpose of calculating your premiums and may deny coverage if you have more than six (6) eligibility points within the past 3 years. Nobody from the auto insurance industry will tell you that you should hire a lawyer for every traffic ticket because it is not in their economic interest to do so. The insurance industry calculates your premiums and discounts based upon many factors with the heaviest weight placed upon your past driving record. While your insurance company may give you a break for your first minor speeding ticket, you will not get a break for your second one or for a major traffic violation such as reckless driving (6 points), careless driving, (3 points), excessive speed violations, and several other traffic violations. If you get a second ticket soon after paying your first ticket, getting a break in the court system is not a given. In fact, the best deals are preserved for those with the best records. You can assume that the prosecutor will have a copy of your driving record when you go to court. Some prosecutors may not make any plea bargain for those with bad records or may only offer a negligible concession. As we have stated, your insurance premiums are based upon risk assessment. Unfortunately, young and elderly drivers are in the highest risk groups and face the biggest economic hits for traffic tickets. Risk rates are higher for all drivers 25 and under as well as drivers 70 and over. More than anyone, these groups need to be proactive and do everything possible to avoid getting traffic tickets and to fight any traffic tickets that occur. Short of a dismissal, the best outcome that one can hope for is to get a traffic ticket reduced down to a NON-POINT AND NON-ABSTRACTABLE offense. The Michigan Motor Vehicle Code contains certain offenses that do not carry any points and are not abstracted on your record. The offenses that we commonly utilize to avoid points and abstracted records are “IMPEDING TRAFFIC” and “DOUBLE PARKING”. We have obtained these best outcome dispositions in every Macomb County District Court. However, getting a best outcome disposition will still require you to pay an assessment of a fine, typically between $150.00 to $180.00., but these offenses will never appear on your record for insurance rating purposes. Expungement forbidden for criminal traffic violations: While we have already explained the advantages of fighting a civil infraction, even greater benefits can be achieved by hiring a lawyer to fight a criminal traffic violation. These advantages include avoiding a criminal conviction on your record; not having to disclose criminal violations on applications for employment and education; excessive fees; insurance points; probation terms and conditions, as well as other license sanctions associated with a criminal traffic violation. Every day, we get phone calls from prospective clients asking if they can get their misdemeanor traffic violations expunged. Unfortunately, criminal traffic violations are may NOT be expunged.. Get a step ahead of the government by calling 844-GOT-ABDO. CPL rights forfeited 3-8 years for criminal traffic violations: If avoiding all the economic burdens and lifestyle constraints described above is not enough justification to hire an attorney and fight your traffic ticket, then it should also be noted that your Concealed Pistol License (CPL) privileges and 2nd Amendment rights are curtailed after being convicted of certain criminal traffic violations in Michgan. For example, Michigan Concealed Pistol License Requirements state that you cannot apply for a CPL if you’ve been convicted of reckless driving in the last 8 years. A single traffic ticket will negatively affect your master driving record and be used by the insurance industry to calculate your automotive premium for the next 3-5 years. According to Gary Biller, President of the National Motorists Association, if you have another traffic violation conviction within that 3-5 year time period, your insurance rates can boost another 15-20%. With the average cost to hire an attorney and fight a traffic ticket ranging from $250 to $400, you’d see the return on your attorney investment within the first 6 months on your automotive insurance rates. The actual cost to fight your civil infraction or criminal traffic violation depends on several factors such as whether someone was injured, whether real or personal property was damaged, your master criminal and driving record, whether the vehicle was insured, whether you were cooperative with the arresting police officer, etc. While simply paying a traffic ticket is purposefully made easy by the government, ABDO LAW has designed an equally as easy and convenient way to fight your traffic ticket. You can retain our Firm with one phone call or email. 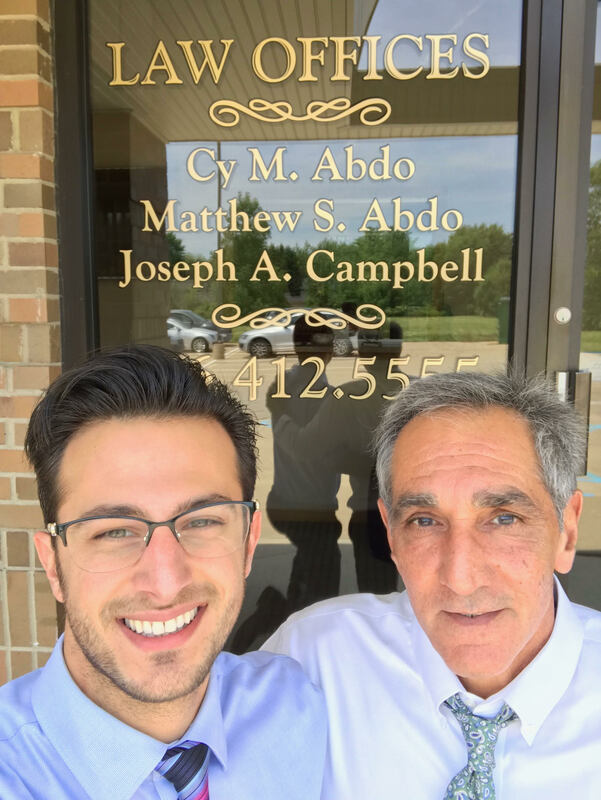 After hiring ABDO LAW to fight a civil infraction, you are not required to appear at the courthouse on your court date; and thus, you will not be forced to take time off work or be away from your home and family. On your court date, you’ll be contacted by our attorneys to let you know the final disposition. With one call to ABDO LAW, you will never have to think or worry about your civil infraction ever again.